As I have mentioned before, my husband and I have moved five times in the past year and he had three apartments before that. I will admit something to all of you – I am home envy! I am constantly jealous of friends and family buying new houses. I desperately want to paint walls. I would love to buy cute patio furniture and have a grill. But I can’t, because I live in an apartment (and more than that, I live on a campus because of my husband’s job and share space with about 500 other people). 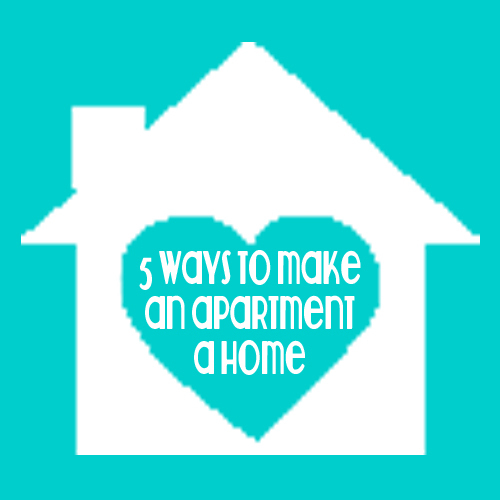 Over the past few years, we have had to get creative in making an apartment a home. It has not always been easy, but there are a few things that have become musts for us. And while I don’t get to paint or put big holes in the wall or re-do the kitchen floors like other DIYers do, I am proud of what I have been able to accomplish in these hospital white walls. 1. 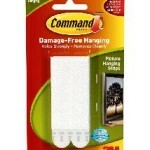 3M Velcro command strips – I have been using 3M strips since college, but these velcro strips have exceeded my expectations. Almost everything in our current home is hung with these strips. For one, the different sizes tell you the weight in which they will hold, which allows you to choose the best option. One set of large velcro strips holds 4lbs which provides me to hang a lot more options than the normal strips without needing to put a whole in the wall (which isn’t always allowed). 2. Floor Lamps – Apartments are not always known for having the best lighting. We have had a couple places with lots of florescent lighting which is in my opinion stark and ugly; who wants to hang out chatting or playing games with corporate office lighting? Florescent lighting is also bad for my migraines. Floor lamps allow for a more comfortable lighting choice wherever needed in your home. 3. Color, Color, Color – This is the most important thing I have tried to accomplish in all of our apartments in order to make it more homey. We have never been able to paint, so that leaves a lot of hospital white. Over the past few months, we have gotten both a blue and red table for different areas of our home. They add such a great pop of color! 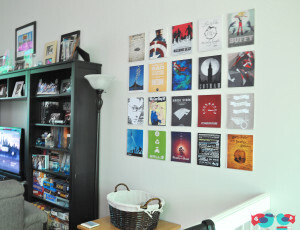 I also try to hang a lot of colorful pieces and picture frames on the walls to help brighten up the room. 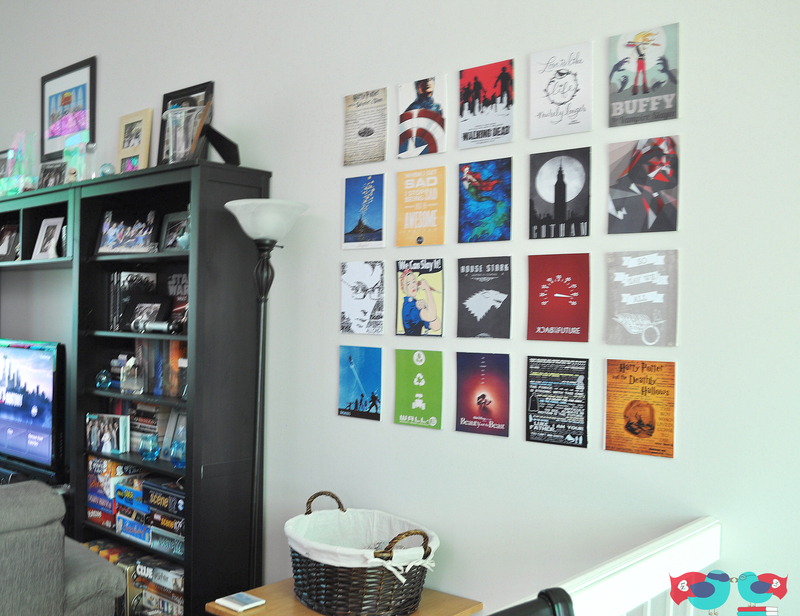 For example, I created this gallery for around $25, and it covers around 4’x4′ space. I have also been working on a hallway gallery for downstairs to cover more white that is almost complete; I can’t wait to share it with you! 4. Curtains – Curtains, either on windows or decorating walls, serves a few great purposes. 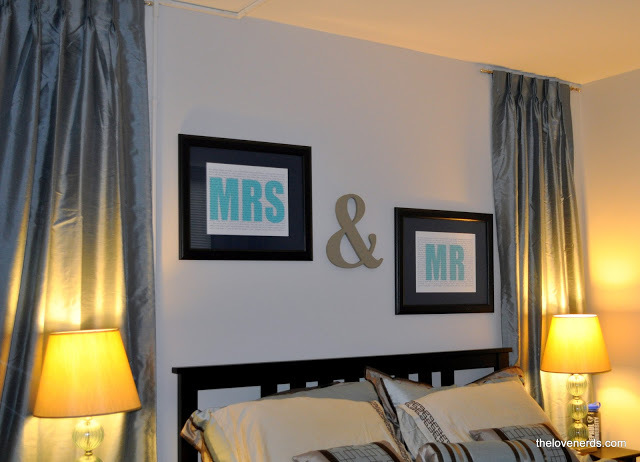 1, they can add a great touch of color to a room that might otherwise be full of white. 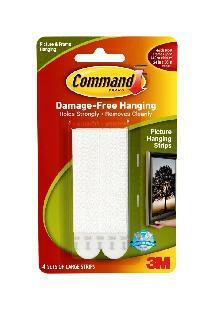 2, they add a comforting, soft appeal to a room. 3, they can decrease sound if you have a room that echoes a lot. At an old apartment, we hung curtains floor to ceiling along two walls that met in a corner; it was the kitchen table nook and allowed us to pretend that we could “paint” the walls. We have gotten a lot of compliments because we use colorful curtains to hide an unappealing maintenance door with a huge padlock on the front. And, in our bedroom, I have curtains hanging along both our windows but I also have curtains that frame our bed. 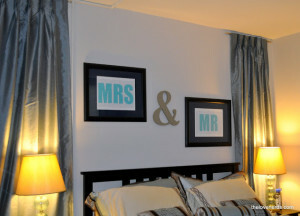 I think they soften the look of the room and give it a bit more sophistication than we would have otherwise. 5. Lots of “hidden” storage space – It can be difficult to find storage for everything in a small space. I am still working on it in our current place; we have a strange closet space in our bedroom, and my working space is rather small. We have acquired multiple open storage shelving – book cases, cube storage, and wire racks – which has definitely helped but I fear our home would look a constant mess if not for baskets. 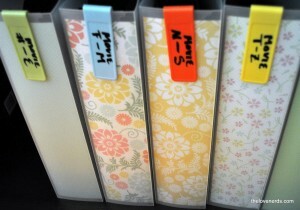 “Hidden” storage space is essential as it allows me to at least make things look for organized than they really are. This includes the DVD storage I undertook in March. 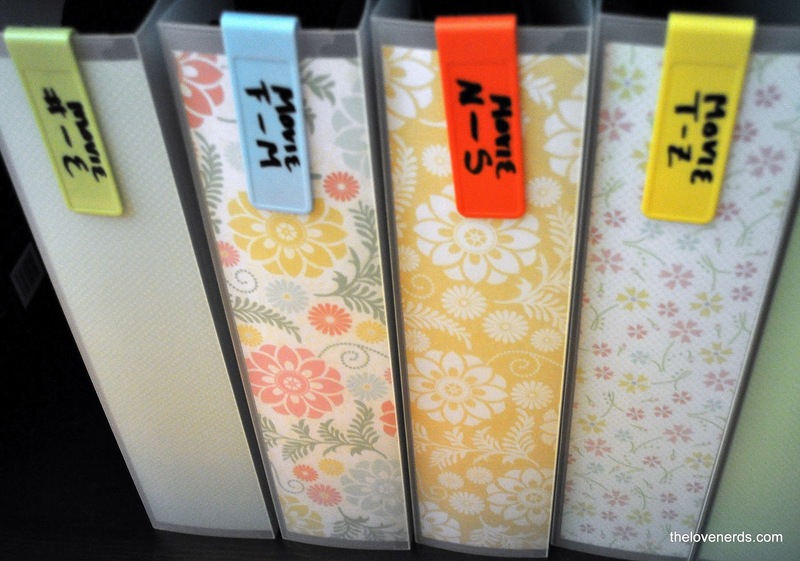 I was tired of seeing so much open shelf space taken up by DVD cases, so I condensed them into nice binders that I decorated with scrapbook paper and colorful dry-erase marker clips. I link up to the following parties, including Serenity Now, Shabby Nest, Whipperberry, Homecoming, Homestories A to Z, Finding Silver Pennies, Organizing Junkie, The Weekly Creative, Thirty Handmade Days, and the Monthly Pinterest Challenge. Great tips. Allie from My Card Party.